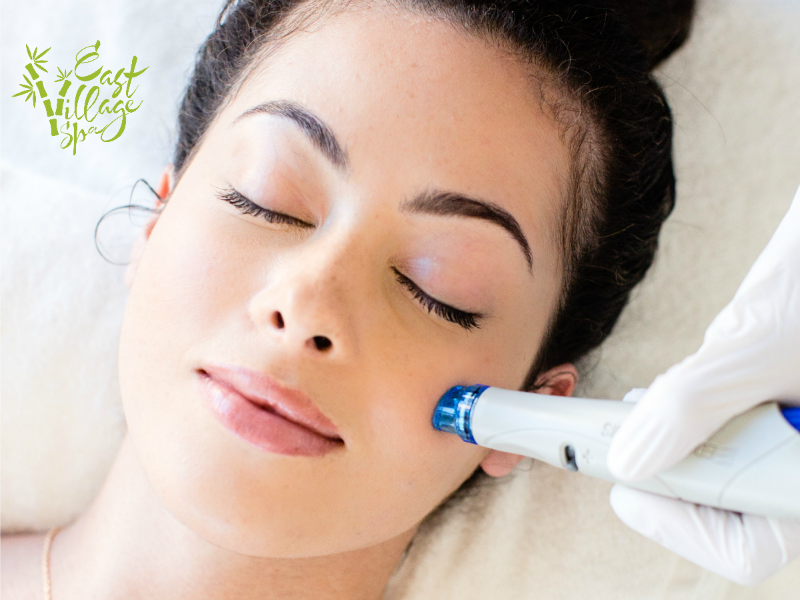 We’re so excited to offer exciting new Hydrafacial technology to our spa guests (and honestly, we’re super pumped to use it on ourselves!) 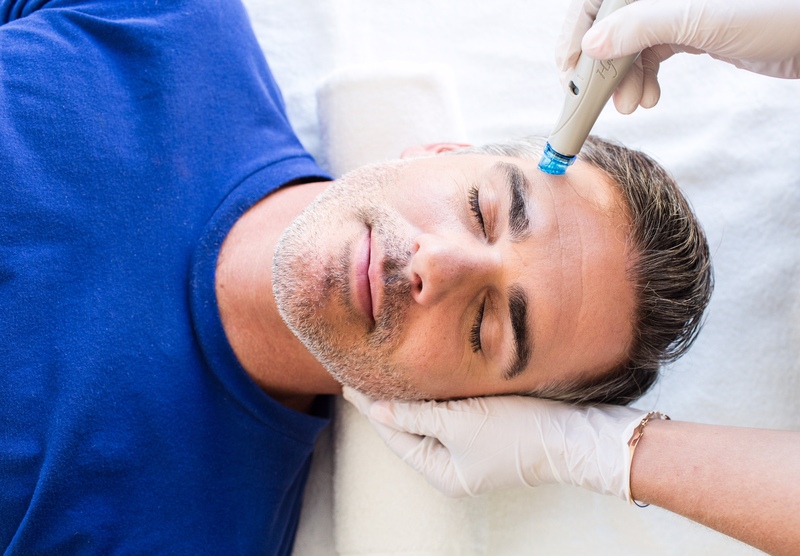 Hydrafacial is quite different than a normal facial, but like all of our services, we want to make sure that our guests still have a relaxing and stress-relieving experience. Camille Arbegast, our managing esthetician and spa Hydrafacial Trainer has answered some of the most common questions our guests have. A: Hydrafacial is a corrective treatment to address any kind of skin concern such as fine lines and wrinkles, pigmentation, and oily/congested skin. The treatment process removes dead skin and painlessly extracts congested pores while infusing hydrating, firming serums into the skin. There is no downtime or “peeling” process with a Hydrafacial like there is with chemical peels. Before and after with a booster designed to plump skin and diminish the appearance of lines and wrinkles. Q: I have oily/acne-prone skin. Is Hydrafacial good for that? A: Yes! Hydrafacial helps to balance oil production and the pH of the skin. During the treatment, the skin is exfoliated with a glycolic/salicylic peel solution and then extractions are performed with a suction technology to painlessly remove impurities. 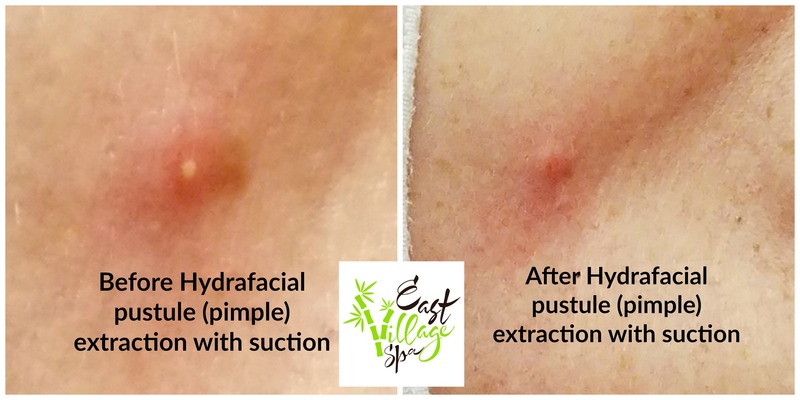 If you find traditional extractions painful, you’ll be pleasantly surprised at how much more comfortable Hydrafacial extractions are! At the end of your service you can look at the canister and SEE the debris removed from your skin! Hydrafacial suction gently extracted this large, painful pustule from my shoulder. By the next day it was completely healed. A: Our most popular Hydrafacial services are 30 or 60 minutes long. While at some clinics, Hydrafacial is a quick in-and-out but as with any of our services we value giving our guests an opportunity to relax and de-stress so we’ve incorporated the TLC you’ve come to expect from our treatments. For those wanting a more abbreviated session, the 30 minute “Classic” Hydrafacial is a good option to start with. This is a great service for any skin type or for people who are just curious about what the Hydrafacial is all about. For those wanting more TLC and more corrective focus on fine lines, hyperpigmentation, or acne, the 60 minute “Deluxe” Hydrafacial is perfect. In addition to the Classic service, you’ll receive a Hydrafacial “booster” serum to focus on your specific concerns or extended extractions if needed. This service also incorporates LED light therapy. Your esthetician can also incorporate either a Rhonda Allison Mask and hydrating hand treatment or gentle lymphatic drainage. The 60 minute option gives your esthetician a greater range of treatment possibilities and flexibility. Q: Will I get instant results? A: You’ll notice instant firmness and a radiant skin tone after just one treatment. While there are no “quick fixes” the Hydrafacial is our most powerful tool yet. We recommend a Hydrafacial once a month to receive the maximum benefit and visibly reduce pigmentation, acne, and fine lines and wrinkles. If you have more corrective skin goals, your esthetician can recommend a customized series of Hydrafacial services or Hydrafacial services combined with Rhonda Allison Peels. Hydrafacial before and after treatment for sun damage. Q: Is special pricing available? A: Yes! If you purchase a series of 3, you’ll get the 4th half price. If you purchase a series of 5, you’ll get the 6th FREE! These pre-paid packages make it easier and more affordable to enjoy regular Hydrafacial treatments. “Parlor” or Practice: Is your massage therapist legitimate? Camdine Cox, LMT, uses a hot compress on a client. Massage Therapists have come under attack from all sides in Iowa in the last year. Early in the year, lawmakers proposed a bill to eliminate massage therapy licensing, which never made it to a vote. Criminals are increasingly and illegally using the phrase “massage therapy” as a front for illicit activities including human trafficking. Local lawmakers are targeting legitimate and licensed massage therapists including long-time small business owners with restrictions and additional fees instead of enforcing existing laws to go after the actual criminals. At East Village Spa, our experienced licensed massage therapy team provides nearly 7,000 massage treatments per year. Some of our team members have over 10 years of experience, some have transitioned to massage from other health fields like nursing; some from other science fields like engineering. As a whole, massage therapists are skilled, trained, caring health care providers. To help consumers to know what to look for when seeking a massage therapist, we’d like to offer the following suggestions. Check the Iowa Department of Public Health licensing website to make sure your massage therapist is properly licensed and has not had disciplinary action taken against them. Ensure you have the proper spelling and legal name when searching. To obtain a license in Iowa, a massage therapist must have a MINIMUM of 600 hours of approved education, passed their national boards, adhere to the laws, and maintain continuing education requirements. Many therapists far exceed this minimum standard. It is illegal to practice massage therapy or call yourself a massage therapist without a license. It is a legal requirement that therapists display their license in their office or treatment space. If you don’t see a license posted, it is safe to assume they are not licensed and you should leave, or check online to verify that they are approved to practice. Value professionalism. Licensed massage therapists should ask their clients to complete a written health history or intake form and update their health information regularly. Massage may need modified for certain health concerns. Your therapist should also keep treatment notes to monitor client progress and record session data. Justin Behanish, LMT, helps a client with a gentle neck stretch. Look for red flags. Therapists must provide safe, clean work surroundings including clean linens and sanitized head rests and massage tools, proper hand washing and common infection control measures. Does the business provide a comprehensive website or written menu of services with rates clearly defined? Are their marketing materials and advertisements clear and professional? Are clinic hours reasonable for a health provider? If your gut tells you something is “off” then it probably is. A licensed massage therapist will ensure your modesty and comfort at all times. If your therapist does not step out of the room to allow you to disrobe and lay under covers, or if they work with immodest or no draping, this is a concern and a breach of their professional ethics. If your massage therapist needs to address sensitive areas like the gluteal, abdominal, or pectoralis muscles, they should discuss this with you prior to work in those areas and obtain your consent. You should still remain modestly draped during massage in these areas. If you feel uncomfortable at any time in a session, ask to end the session. Phrasing matters. Licensed massage therapists use professional terminology when referring to their treatments. A massage therapist will never refer to him or herself as “masseur or masseuse,” terms that have been co-opted by people providing illicit services under the guise of massage. Also, licensed massage therapists work out of practices, offices, clinics, spas, salons, hospitals, in-home, etc… but they do not refer to their work place as a “parlor” which is another phrase commonly used to insinuate illicit activities take place. Like you would when seeing a new doctor or counselor, seek out referrals for a massage therapist. Read reviews online, read therapist bios, look into education and specialties to find the best massage therapist for your needs and preferences. Brandi Munch, BA, LMT massages a clients shoulder. Licensed massage therapists play a vital role now that traditional healthcare expenses are ballooning, where people are realizing the importance of alternatives to opioid pain medications, and seeking to manage stress for their overall health. It is my hope that lawmakers and people in authority will use the existing state laws to go after the human traffickers and people who are hiding under our professional title without punishing ethical, legal, LICENSED massage therapists and making it more difficult for consumers to take advantage of a safe, healthy, massage. Learn about our licensed massage therapy team here, or schedule your therapeutic massage session by clicking here! This post was written by Cassie Sampson, BA, LMT. Cassie has been an Iowa Licensed Massage Therapist since 2005, has served as massage therapy educator, and is proud to employ an incredible team of licensed massage therapists who make a difference in the lives of their clients every day. After a few weeks of 60-degree “winter” weather, I think we can’t complain about the cold and wind we’ve experienced the last few days. I personally can tell I’m due for a change in my skin routine. My hands are cracking and my lighter moisturizer just isn’t cutting it for my face. Our Managing Esthetician, Camille Arbegast, shared some tips for changing up your skin and body care routine to account for colder, dryer temperatures and less time in the sun. Rhonda Allison Ultra Hydration Cream: This is by far our #1 best selling product when the weather gets cold and windy. This moisturizer uses the purest form of Hyaluronic Acid which can increase the skin’s moisture by 300%. The best thing about this moisturizer is that it doesn’t feel super heavy and leaves the skin feeling nice and smooth. 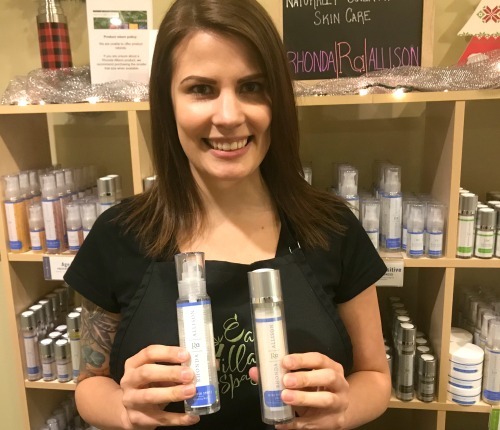 Rhonda Allison Cucumber Spritz: This product is great all year round, but in the winter when skin tends to feel “tight” from dryness, especially in stuffy offices, a mist of the cucumber spritz throughout the day will help you feel more hydrated. Plus, it is a good way to perk you up in the middle of a work day! Rhonda Allison Drops of Essence: These hydrating drops are a healing, heavy serum that will help to soothe chapped winter skin with high concentrations of lavender and geranium essential oils. They can be effective for skin burns (including wind burn), cold sores, and even help with the appearance of scars. Two powerful serums, ChronoPeptide A and C-Stem Cell help to reverse summer damage. 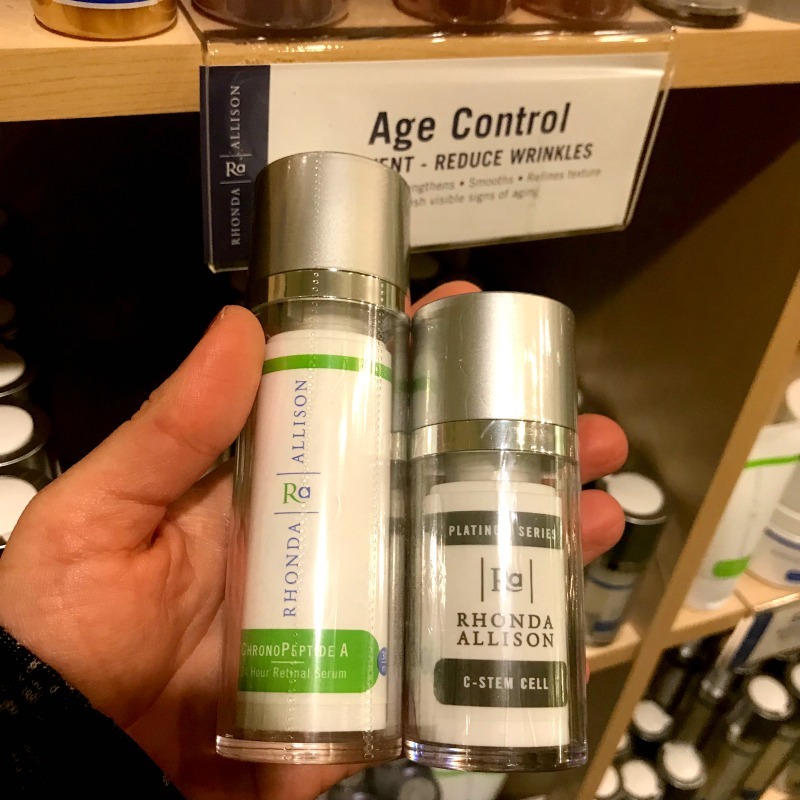 Rhonda Allison ChronoPeptide A uses the purest form of Vitamin A to brighten, strengthen, and firm the skin without the irritation found in some commonly prescribed vitamin A products. Rhonda Allison C Stem Cell is a 20% Vitamin C serum that not only helps lighten pigmentation, but increases hydration, reduces redness, and minimizes the appearance of fine lines and wrinkles. Farmhouse Fresh Honey Heel Glaze: This mask is for more than just feet and is one of our best-selling spa products. Brush on this hydrating, soothing mask on dry hands, elbows, knees, heels, wrap with plastic wrap, socks, or gloves, and let let it gently exfoliate and hydrate dry skin. We incorporate this into our signature services and many of us personally use this product. You can wash it off or put it on before bed for an overnight miracle fix for dry skin! 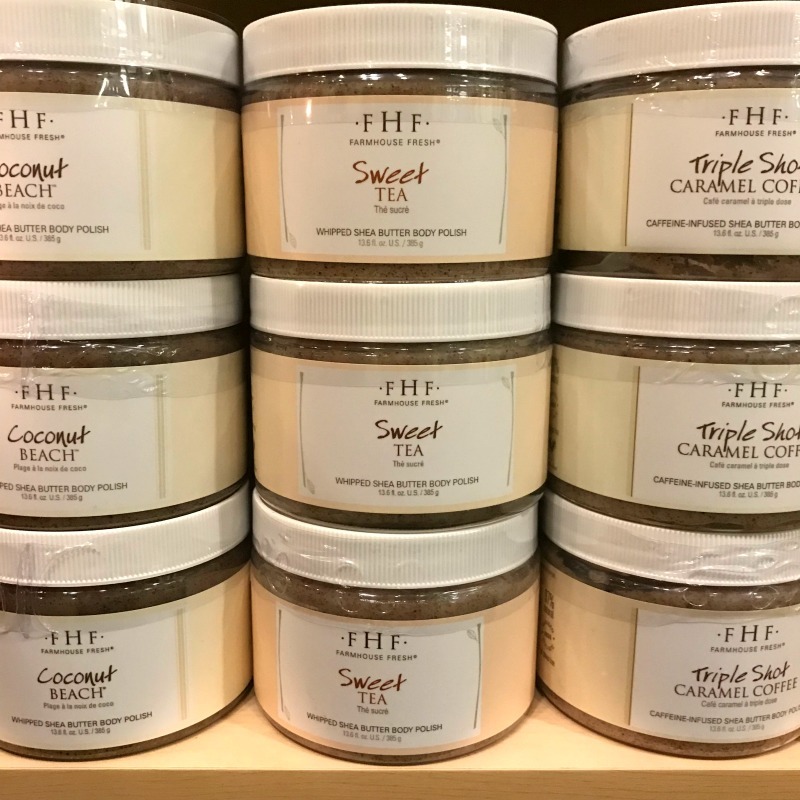 Farmhouse Fresh Shea Butter Scrubs: These are the most hydrating body scrubs we carry. Unlike salt scrubs which can irritate dry, cracked skin, shea butter scrubs are gentle, not TOO abrasive, and will leave your body feeling hydrated like you’ve just applied lotion. We carry 3 delicious scents. Camille recommends a weekly full body exfoliation. These are also great to help prevent ingrown hairs after a wax. CND Solar Oil: Cuticle oil is important year round, but in the winter, dry cuticles can become painful and picking at your cuticles and nails can lead to infection. Apply a few drops of CND Solar Oil after your shower or before bed to keep cuticles soft and help you resist the temptation to pick! Stop into the spa anytime to ask our front desk for advice on the best hydration products for your needs or click here to book yourself a hydrating body scrub or facial at the spa!